You’ve brought the new Genesis II or Genesis II LX into your backyard barbecue scene, and it’s time to add that personal touch by serving up meals from both the original grates and the griddle! The big question is which griddle fits my new Genesis? Well I am excited to inform you that griddle #7599 fits all Genesis II/ Genesis II LX 300, 400, 600 series models. However, the griddle does fit each model a little bit differently. If you take a look at the griddle, you’ll notice the griddle has a little lip. This lip will rest over the grate on the 400 series model. On the 300 and 600 series model the griddle rests nicely inside the grates. 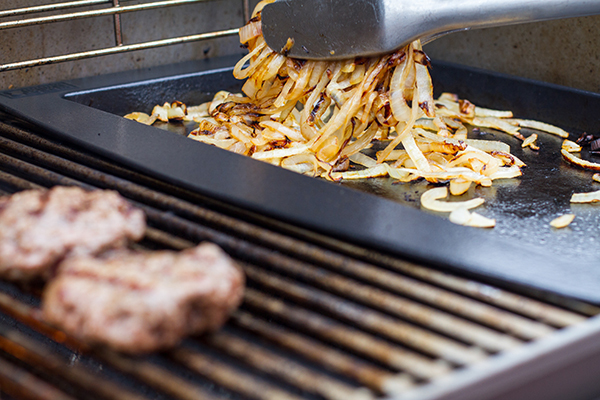 The griddle makes the opportunities endless and allows you to add that extra flavor to your meal that may have taken a tumble through the grates if the griddle didn’t offer you otherwise. Try adding an egg to your burger like we do in our Smoked Salmon Burgers with Fried Eggs and Scallion Cream Cheese recipe, or even surprise your friends by making sausage and potatoes!